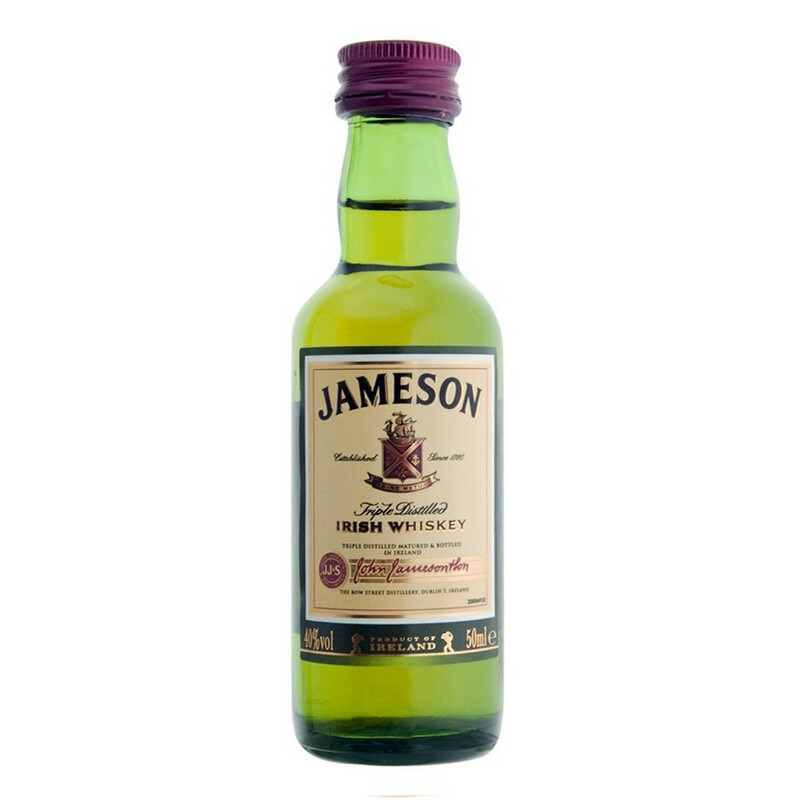 The miniature bottle of Irish whiskey Jameson is perfect to make a small gift or to discover "the Smooth Whiskey". 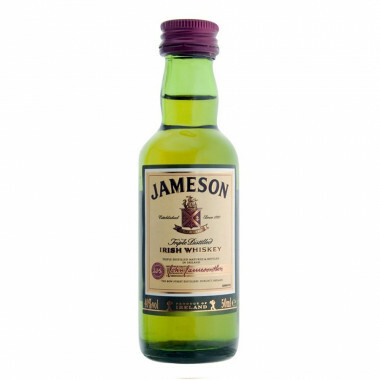 Jameson Irish whiskey is a blend made from pure water and a mix of malted and non-malted barley. The selected barley is dried with hot air in closed ovens. The smoke does not come into contact with the grain, which allows the natural taste of the barley to express itself fully. Like all Irish whiskeys, it is distilled three times and this is distilled especially slowly into copper stills. The result is soft and mellow due to the slow maturation in old American oak barrels and sherry. This is the most sold whiskey in France! Jameson Irish Whiskey has been established by John Jameson in 1780 in Dublin. He had then the ambition to produce the best whiskey in the world. The Jameson brand intended to excel in quality and flavour. At a time when whisky was usually sold quite young, John Jameson quickly became recognized for his professional knowledge and great care given to maturation. Jameson is indeed considered as one of the pioneers of maturation in ex-Sherry casks. His approach set a new quality standard that lasts and made Jameson the most popular whiskey brand in France and worldwide. In 1966, John Jameson & Son decided to merge with whiskey production companies John Power & Cork Distillers to form the Irish Distillers Ltd group, today owned by Pernod-Ricard. The complete whiskey production has been relocated in Midleton, near Cork, where a new distillery has been built. Midleton distillery is one of the most modern distilleries worldwide. Its production capacity reaches 19 million liters of alcohol per year; with 13 stills producing every type of Irish whiskeys. Even if the location changed, Jameson kept alive his unique knowledge and combines it with cutting edge technologies to produce whiskey in the authentic tradition of Jameson. The malted barley is then triple-distilled followed by long years of maturation, producing an exceptionally smooth whisky, with strong flavours of Sherry and wood. The Jameson Irish Whiskey is obtained through a clever combination of malted barley and non-malted barley with pure water. Barley is then dried in a closed kiln powered with natural gas, to make sure the whiskey develops no smoky or peat flavours. The secret of Irish whiskey making lies in its slow triple distillation in copper stills. This process conveys to the whiskey all of its remarkable smoothness and round mouth. The smooth Jameson Irish Whiskey and its sweet notes are attributed to the slow maturation in old American oak casks and ex-Sherry casks that age several years in dark warehouses. Nose: velvety with toasted wood, Sherry, spicy and fruity aromas. Palate: in harmony with the nose, smooth, mellow with light notes of wood and a hint of nuts. Finish: incredibly smooth, evolving onto notes of grains and spices.